Established in 1994 Mosaic Clubhouse is a community mental health resource and opportunity centre predominantly for the Lambeth community but reaching into surrounding boroughs. In 2015 following analysis of the organisations services and goals Mosaic adopted a number of recognised outcome measures to clearly demonstrate the benefit of the services provided. The data collected has been analysed by staff from the School of Health and Social Care at London South Bank University . Mosaic has always had a rich source of activity data in the form of member testimonies, as well as our annual satisfaction survey and the feedback that arises in daily morning meetings and twice daily unit meetings. The board however have always felt that in order to demonstrate the impact of the model to funders, we also needed impact data in the form of validated measuring tools. 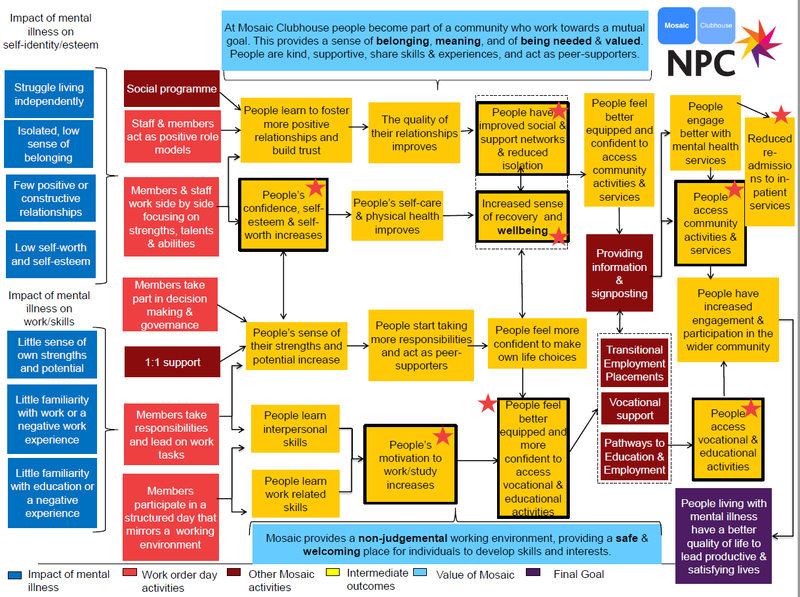 Therefore in 2015 Mosaic contracted with New Philanthropy Capital (NPC) to engage members, staff and trustees in a theory of change exercise (ToC). The ToC exercise focuses on reaching an agreement on our overarching goals. What is it we are trying to achieve and then identifying the actions and processes necessary to achieve the goal or goals. It is an intense and very valuable exercise that requires consensus amongst those taking part in the exercise. At Mosaic Clubhouse we agreed that our overarching goal is that “people living with mental illness have a better quality of life to lead productive and satisfying lives” . Intermediate outcomes that form our outcome measurement framework. Having agreed what we are trying to achieve we mapped the steps that describe our inputs, and look at what we think the outputs and outcomes are that lead members to achieve a better quality of life and lead productive and satisfying lives. We then explored whether there were validated tools that could help us to measure these improvements. We started collecting the data from new members in January 2016 by issuing the short personal well-being questionnaires (PWQs) with each new referral form. We then asked people to score themselves again at twelve weeks, six months and twice a year thereafter. We also started collecting baseline data from existing members using the same timescales. You can read the full document here . The holistic service and community of Mosaic Clubhouse improves wellbeing over time for all and members’ improvement is commensurate across gender and ethnicity. At Mosaic Clubhouse, the diversity of members mirrors the demographic diversity of the mental health population in Lambeth. Our impact data demonstrates that the clubhouse model is contributing to the elimination of current gendered and ethnic inequalities in mental health service experience and outcome . Mosaic Clubhouse supports the government and NHS agenda to ensure parity of esteem between mental health and physical health . Social perceptions and self-esteem in members improves over time; linked to improved social support networks, improved motivation and decreased isolation and in turn linked with increased appropriate access to other community & health services.